Hotel is equipped with well-appointed rooms. All rooms are comfortable, spacious and elegantly appointed having unrestricted view of old city and Pichola Lake. Hotel Wonder View Palace brings together both modern comforts and traditional style. Maharana Pratap Airport is 24 km, City Railway station is 3 km and City Bus station is 3 km from Hotel Wonder View Palace. Doctor on Call, Backup Generator, Internet/Wi-Fi, Room Service, Currency Exchange, Wedding Services, Disabled Facilities, Airport Transportation, Security Guard, Restaurant. Desk, Complimentary Newspaper, Climate Control, Toothbrush/Razor on Request, Cable/Satellite TV, Reading Lamps, Wakeup Calls, Room Heater, H/C Water, Iron/Ironing Board. 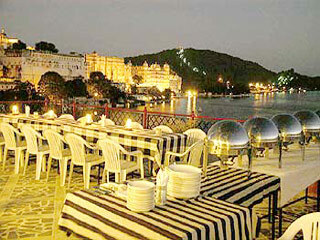 User reviews for "Wonder View Palace Hotel Udaipur"